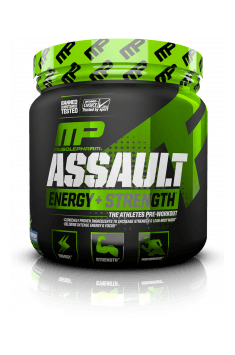 Muscle Pharm Assault Sport is an advanced pre-workout supplement containing creatine monohydrate, β-alanine, betaine anhydrous, taurine, L-glycine, acetyl-L-carnitine, caffeine, and vitamins (C, E, B6 and B12). Taking the product before workout supports the ability of the organism to continue physical activity for a long time, helps to increase the efficacy and intensity of exercise, boosts energy, strength and endurance, and enhances concentration. Creatine monohydrate is a substance whose positive activity in sports supplementation has been supported by hard evidence. Taking creatine improves the functioning of skeletal muscles by contributing to their increased strength and mass. During highly intensive physical activity, the energy essential for resynthesising ATP comes mainly from the simultaneous breakdown of phosphocreatine and anaerobic glycolysis. Creatine supplementation during training periods characterised by high intensity increases the ability of the organism to produce ATP, which helps to increase strength and muscle mass. Carnosyn® is a patented form of beta-alanine. In the human organism, the substance is subjected to conversion to a carnosine molecule, which is deposited in cells and released when pH drops. During intensive training, carnosine supplementation can protect the organism from the negative consequences of increased lactic acid production. It has been proven that taking beta-alanine delays muscle tiredness, increases their endurance, and accelerates post-workout regeneration. Thanks to that, beta-alanine has a beneficial effect on the increase in strength and muscle mass, and during strength workout, it helps to do more repetitions than usual. Betaine anhydrous plays an important role in maintaining water balance in cells, coordinating the most important metabolic functions, and inhibiting many pathogenic processes. Betaine is a lipotrope, which means that it can prevent or inhibit fat deposition in the liver. Apart from that, it can serve as a methyl group donor in order to reduce homocysteine levels in the system, participate in the biosynthesis of many crucial compounds that play an essential role in protein metabolism, and take part in protecting the organism from high concentrations of electrolytes and urea. Like in the case of creatine, increased intracellular betaine concentration increases cell hydration, which creates a more beneficial environment for anabolic processes. Such properties make betaine a perfect addition to supplementation for athletes and physically active people, as it can help to improve their results. Taurine is an amino acid that supports anabolic processes in the organism. The available literature depicts taurine as a substance that takes part in transporting creatine and glucose to muscle cells. In supplementation for active people and athletes, it is also associated with anti-catabolic properties and a role in improving concentration and endurance during workout. L-Glycine performs the function of a neurotransmitter, has a beneficial effect on the functioning of the central nervous system, and improves concentration and memory. Apart from that, it exhibits anti-inflammatory, antispasmodic and antipsychotic properties, enhances sleep quality, plays an important role in the biosynthesis of the hormones that determine the right functioning of the immune system, helps to prevent degenerative diseases, and reduces the risk of developing diseases connected with weak muscles and bones, as well as supports regeneration after injuries. Caffeine anhydrous, because of high assimilability, is characterised by stronger activity than its normal form. Caffeine blocks adenosine receptors in the brain, which helps to reduce the symptoms of fatigue and increase activity. Apart from that, it has a positive effect on oxygen management, thanks to which the user’s exercise capacity increases. Among athletes, caffeine is an agent used for stimulating the nervous system. Moreover, because of its thermogenic effect, it can help to reduce adipose tissue. Acetyl-L-carnitine is the acetylated form of ordinary carnitine. It exhibits antioxidant, neuroprotective, and metabolic properties. Taking it can affect the sensitivity of tissues to the activity of insulin and increase the importance of long-chain fatty acids in generating and spending energy, thanks to which it supports weight loss. Acetyl-L-carnitine supplementation is recommended in the diet of physically active people, as it helps to shape the body and reduces the feeling of tiredness, that way increasing the possibility of becoming more active. The main functions of vitamin C are: helping to improve the functioning of the immune system, supporting the circulatory system, participating in collagen biosynthesis, maintaining normal connective tissue functions, and preventing the activity of free oxygen radicals. The demand of the organism for ascorbic acid increases when people train heavily and for a long time. Vitamin C deficiency most frequently manifests itself through overall weakness, feeling tired, lower physical capacity, increased vulnerability to infections, worse wound healing, bleeding gums, disorders in collagen synthesis, and distortions in all other processes where ascorbic acid is needed. Vitamin E (alpha-tocopheryl acetate) is an antioxidant that protects polyunsaturated fatty acids and phospholipids that form cell membranes from the destructive activity of free oxygen radicals. Vitamin E is used for supporting and treating muscle disorders and heart diseases, and its deficiency can lead to neurological disorders, a deteriorated ability to concentrate, irritability, disorders in the functioning of skeletal muscles and their weakness. Vitamin B6 (pyridoxine hydrochloride) participates in the production of antibodies, thanks to which it helps to increase the organism’s immunity, takes part in the metabolism of energy components, conversions of tryptophan to niacin, the production of red blood cells, and the synthesis of hormones (for example, histamine, serotonin). Vitamin B12 is essential for the normal functioning of the organism but cannot be synthesised by it. Its active form takes part in the metabolism of energy components (proteins, carbohydrates, and fats), affects DNA synthesis and the functioning of the nervous system, as well as prevents anaemia. Available sources report that there is a significant connection between the consumption of vitamin B12 and the reduction of fatigue and tiredness. Insufficient consumption of the vitamin and the symptoms of anaemia connected with it can cause low energy levels, lower tolerance to physical effort, tiredness, dyspnoea, and palpitation. To sum up, Muscle Pharm Assault Sport is a dietary supplement that has a significant effect on improving the organism’s capacity and allows users to intensify training. The product is recommended for physically active people and athletes who suffer from low levels of energy and motivation to train. The addition of vitamins with a wide range of health-promoting properties increases the organism’s resistance to stress, diseases, and elevates the mood in tough training periods. The preparation also has thermogenic and lipotropic properties that can support adipose tissue reduction. Mix 1 scoop of ASSAULT™ in 8-12 oz. (236-354 mL) of water 20-30 minutes before training. For optimal results, drink a minimum of 1 gallon of water daily. Because of the presence of stimulants that make falling asleep more difficult, it is not recommended to use the preparation in the evening. It is best to take it on an empty stomach, as in that way the active components in the product will not compete with the food in the digestive system to be absorbed. It is not recommended to increase dosage to amounts higher than recommended – the presence of the best components ensures efficient activity throughout a supplementation period. We do not advise using the product before every training. Doing it can make you develop tolerance to the components of the supplement. When using it for the first time, we recommend that you take a reduced dose, which will allow us to determine your organism’s tolerance to the activity of the preparation. MUSCLE PHARM is an American company specializing in the manufacture of preparations for bodybuilders who want to improve the results achieved in the gym. The wide offer includes protein supplements, supplements increasing the production of testosterone and supplements helping you to burn fat and pre- and post-ex workout supplements. MUSCLE PHARM is appreciated by professional athletes because of its high effectiveness and safety. Stimulator of growth hormone secretion. It accelerates regeneration and anabolism, works anti-catabolic. Alpha GPC can support the brain’s synthesis of acetylcholine and helps promote normal cognitive function. Advanced preparation supports regeneration, facilitates falling asleep and increases libido. 1000mg of glycine in each capsule. Supports nervous system functions and makes it easier to fall asleep. Carbohydrate product for athletes. It provides more power and faster regeneration processes. Sodium chloride (NaCl) - salt, the main source of sodium and chloride in the diet. Chlorine is a component of the digestive juices (gastric juice and saliva), regulates the acid-base while maintaining proper pH factor. enhances the removal of metabolic waste products. A deficiency of chlorine can cause metabolic disorders. Sodium is a component of intracellular fluids responsible for water and electrolyte balance and supplements the action of chlorine. The excess - increases the risk of high blood pressure. Both components activate the enzymes responsible for the digestion of starch. Dosage: Used to give taste to dishes. In its chemical composition there is a sufficient dose of NaCl. The optimal dose is approx. 5 grams per day. Betaine (N, N, N-trimethylglycine, the TMG) ​​is methyl glycine derivative participating in the conversion of homocysteine ​​to methionine. It is present in food of plant origin and produced by the body in the liver or kidneys. The medicine uses it in the treatment of gastrointestinal and digestive disorders and hyperhomocysteinemia. In the supplements that increase the level of homocysteine ​​used together with glycocyamine, indirectly influences the endogenous synthesis of creatine. There is no mono-preparation supplement containing betaine. Available in creatine stacks and the detoxicating supplements.